US President Donald Trump has charged ahead with his pledge to build a wall at the US-Mexico border, skimming over the details of lawmakers&apos; tentative deal that would give him far less than he&apos;s been demanding and declaring he&apos;s "setting the stage" to deliver on his signature campaign promise. 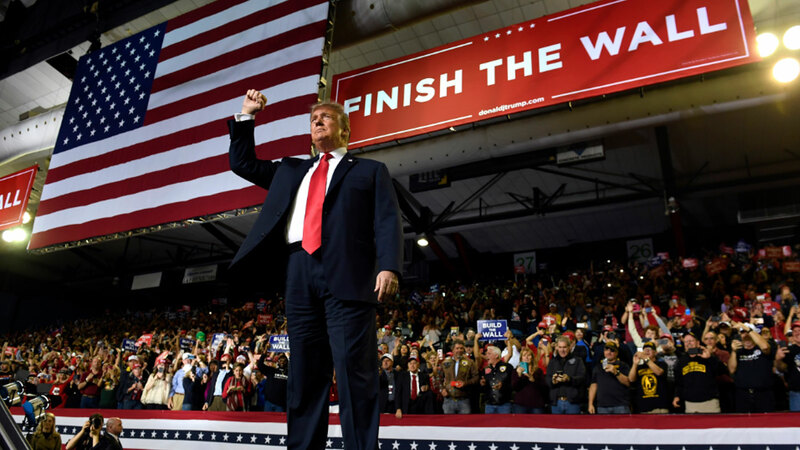 In the first dueling rallies of the 2020 campaign season, Trump&apos;s "Finish the Wall" rally in El Paso went head-to-head against counterprogramming by former Democratic congressman Beto O&apos;Rourke, a potential Trump rival in 2020, who argued that walls cause more problems than they solve. The rallies across the street from each other served as a preview of the heated fight over the direction of the country that has now begun in earnest. And they made clear that Trump&apos;s long-promised border wall is sure to play an outsized role in the presidential race, as both sides use it to try to rally their supporters and highlight their contrasting approaches. "Walls work," said Trump, whose rally was repeatedly interrupted by protesters. O&apos;Rourke, meanwhile, held a countermarch with dozens of local civic, human rights and Hispanic groups in his hometown, followed by a protest rally attended by thousands on a baseball field within shouting distance from the arena where Trump spoke. "With the eyes of the country upon us, all of us together are going to make our stand here in one of the safest cities in America," O&apos;Rourke said. "Safe not because of walls but in spite of walls." Meanwhile, US congressional negotiators say an "agreement in principle" has been reached on border security funding, potentially averting another round of federal shutdowns. But three people familiar with the deal told Associated Press the accord would provide $USD1.375 billion to build 100 kms of new border barriers. That&apos;s well below the $USD5.7 billion President Donald Trump demanded to build over 400 kms of wall along the Mexican boundary. The money will be for vertical steel slats called bollards, not a solid wall. Bargainers agreed to fund 40,520 beds to detain immigrants entering or in the US illegally. That&apos;s the same number funded last year, though the actual figure held is around 49,000. If legislators don&apos;t act, hundreds of thousands of federal workers will be furloughed for a second time this year. The politicians wanted to reach an agreement to allow time for the legislation to pass the House and Senate and get signed by President Trump. "It&apos;s up to the Democrats," Trump told reporters at the White House when asked whether the government was headed toward its second shutdown of the winter.